From The Office of Dietary Supplements - National Institute of Health Who may need supplemental selenium? In the United States, most cases of selenium depletion or deficiency are associated with severe gastrointestinal problems, such as Crohn's disease, or with surgical removal of part of the stomach. These and other gastrointestinal disorders can impair selenium absorption [26-28]. People with acute severe illness who develop inflammation and widespread infection often have decreased levels of selenium in their blood . Physicians will evaluate individuals who have gastrointestinal disease or severe infection for depleted blood levels of selenium to determine the need for supplementation. People with iodine deficiency may also benefit from selenium supplementation. Iodine deficiency is rare in the United States, but is still common in developing countries where access to iodine is limited . Researchers believe that selenium deficiency may worsen the effects of iodine deficiency on thyroid function, and that adequate selenium nutritional status may help protect against some of the neurological effects of iodine deficiency [6,7]. Researchers involved in the Supplementation en Vitamines et Mineraux AntioXydants (SU.VI.MAX) study in France, which was designed to assess the effect of vitamin and mineral supplements on chronic disease risk, evaluated the relationship between goiter and selenium in a subset of this research population. Their findings suggest that selenium supplements may be protective against goiter, which refers to enlargement of the thyroid gland . Selenium and Cancer Observational studies indicate that death from cancer, including lung, colorectal, and prostate cancers, is lower among people with higher blood levels or intake of selenium [36-42]. In addition, the incidence of nonmelanoma skin cancer is significantly higher in areas of the United States with low soil selenium content . The effect of selenium supplementation on the recurrence of different types of skin cancers was studied in seven dermatology clinics in the United States from 1983 through the early 1990s. Taking a daily supplement containing 200 mcg of selenium did not affect recurrence of skin cancer, but significantly reduced the occurrence and death from total cancers. The incidence of prostate cancer, colorectal cancer, and lung cancer was notably lower in the group given selenium supplements . Research suggests that selenium might affect cancer risk in two ways. As an anti-oxidant, selenium can help protect the body from damaging effects of free radicals. Selenium may also prevent or slow tumor growth. 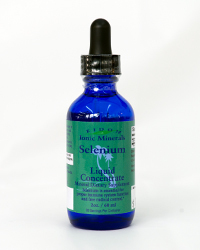 Certain breakdown products of selenium are believed to prevent tumor growth by enhancing immune cell activity and suppressing development of blood vessels to the tumor. Researchers continue to investigate the relationship between selenium and HIV/AIDS, including the effect of selenium levels on disease progression and mortality. There is insufficient evidence to routinely recommended selenium supplements for individuals with HIV/AIDS, but physicians may prescribe such supplements as part of an overall treatment plan. It is also important for HIV-positive individuals to consume recommended amounts of selenium in their diet.